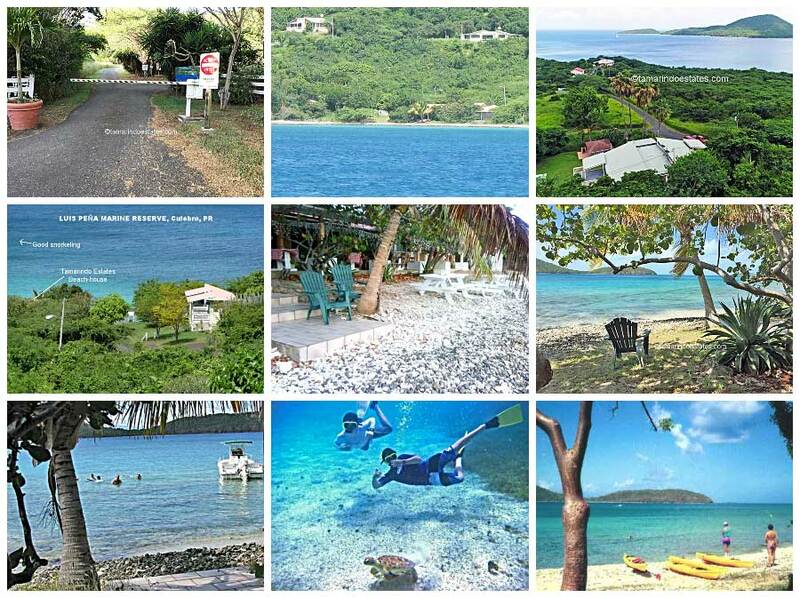 A BEAUTIFUL GATED PROPERTY PROVIDING 12 VACATION RENTALS IN THE MIDST OF 60 ACRES OF GREEN, VIRGIN LAND WITH CULEBRA'S ONLY PRIVATE SNORKELING BEACH. You should check availability and BOOK DIRECT with us here, the OFFICIAL SITE for Tamarindo Estates. You may not be able to book or check availability at booking agents like Expedia.com, TripAdvisor.com, flipkey.com, priceline.com, etc. There are no 5 star properties on Culebra but Tamarindo Estates Beach Apartments offers you a 5 star location. The ocean views, privacy, and private access to the best walk-in snorkeling beach are unmatched. Click here for location images. Come enjoy our 60-acre gated property located on Culebra's only Marine Reserve and avoid street noise, airport noise, boom boom music (common throughout the Caribbean) and noisy neighbors. Tamarindo Estates is just 3 minutes from world class Flamenco Beach and just a 5 minutes’ drive to town where you can find restaurants, grocery stores and local night life. Cleanliness is our highest priority and our caretakers, who live on the property, are available 24/7 to make sure your stay is enjoyable. Our hosts are waiting to make you part of our ever growing family of repeat guests. 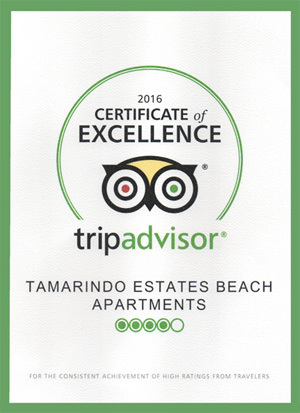 OUR RENTAL APARTMENTS AND SURROUNDINGS: The remarkable TAMARINDO ESTATES BEACH APTS. is a quiet, small, nicely secluded inn (yet an easy 5-minute drive to town) of only twelve 1-BR apartments in the midst of 60 acres of virgin, undeveloped greenery by Tamarindo beach. You may enjoy great views from the apt. 's roofed deck and patios, and easy walk-in to a world-class reef, ideal to get away from the norm of everyday living and enjoy a refreshing change of pace. 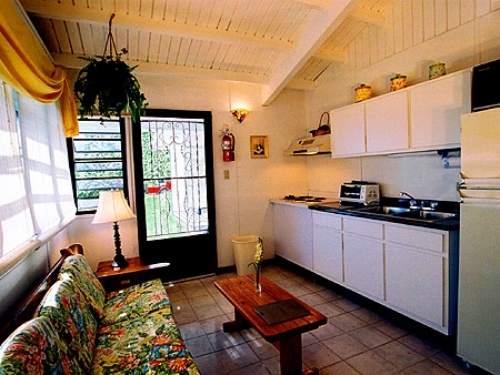 Each apartment provides clean, basic, rustic accommodations with its own private kitchen. We do not provide any luxury. What we do offer, in the way of luxury, is 60 acres of luxurious, undeveloped greenery on the ocean with spectacular views and stunning sunsets. We offer security, a gated entrance, and we have, housed here on the property, caretakers that are on call at all times, to care for guests needs. Each of the 480 sq. ft. (45 sq. mt.) apts. 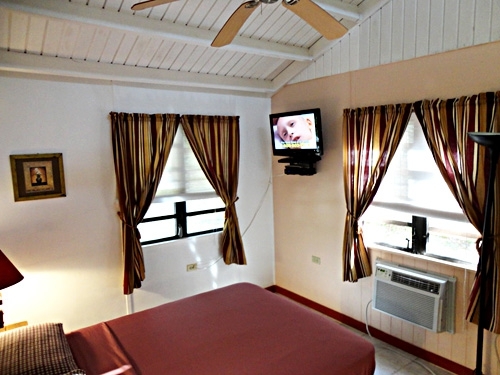 has a/c in the bedroom, flat screen TV, ceiling fans, screened windows and door, private bathroom with shower, kitchen with electric cooktop, refrigerator-freezer, microwave oven, coffee maker, toaster, silverware, cookware, towels, and bed linen. We supply, to get you started, paper towels, toilet paper, dish soap, full sized bars of bath soap, and lined garbage cans in the kitchen and bathroom. We do not supply any food items and we do not offer maid service. Typically there are three independent attached apartments. (Typical floor plan.). Wi-fi is free of charge. We also provide a private beach-house for guests to take shade, read a book, relax or whatever while on the beach, with restroom facilities. The rental apartments are a bit farther inland, in the hilly vegetated interior, affording gorgeous views of the ocean and other cays. 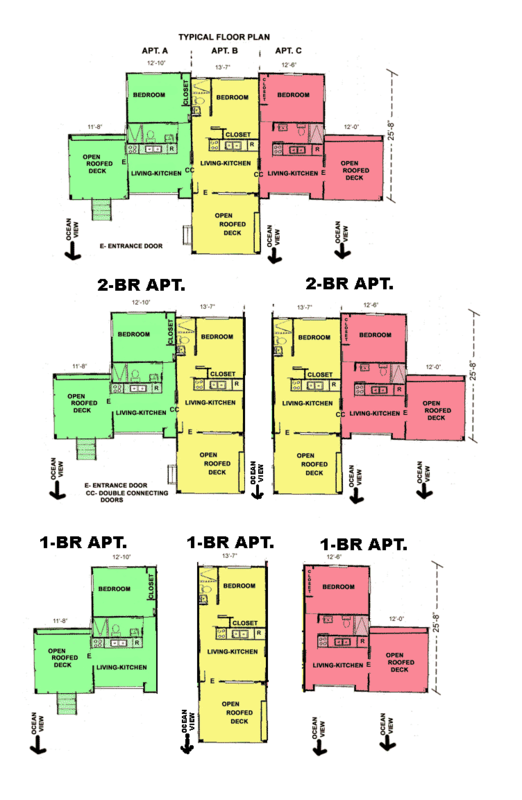 Another rental option is the 2-BR, 2-Bath (Double-sized) Apt.- For families with teens that want larger accommodations we could rent 2 adjoining-connecting 1-BR apts. 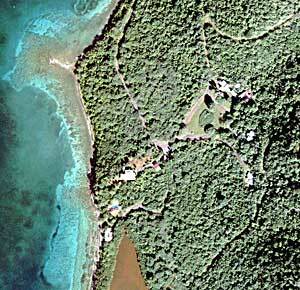 For your privacy and tranquility, Tamarindo resort only has 12 apartments in a 60-acre undeveloped estate. 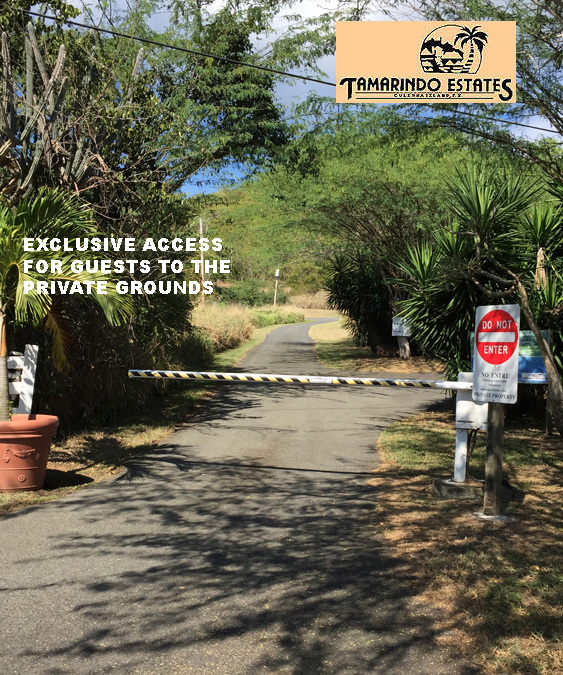 Guests are provided with a beeper to open a gate that leads to the private grounds of the Tamarindo Estates beach property. Living on-site, on the premises, a Resident Caretaker is available on-call 24 hrs a day - unlike most other rentals - who is easily accessible to the guests. All our rentals are kitchen-equipped units, thus saving on food costs. Silverware, cookware, towels, and bed linen are also provided. Air-conditioned bedrooms.Doors and windows are screened. Wi-fi is free of charge, subject to our internet provider, the P.R. Telephone Co.
Flat Panel TV for each rental apartment. 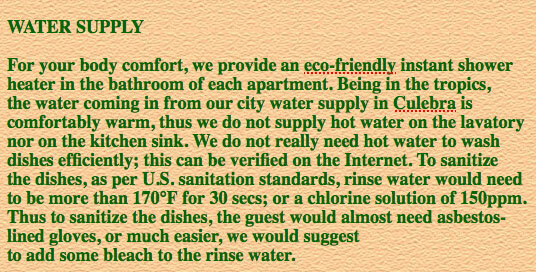 Water Supply: We provide an eco-friendly instant shower heater in the bathroom. More on water supply, click here. Each apartment has its own roofed verandah to sit and enjoy the ocean views. A beach-house for taking shade while on the beach, and restroom facilities. The beach-house is not for rent. 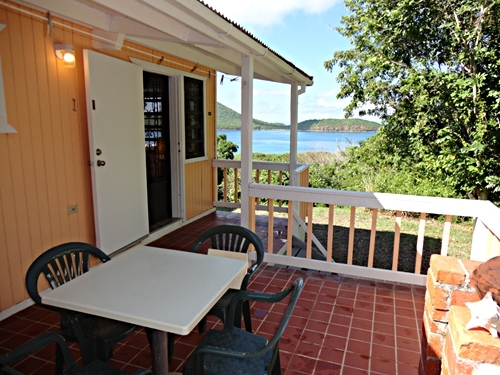 The rental apartments are a bit farther inland, in the hilly vegetated interior, affording great views of the Culebra coastline and other cays. Tamarindo Estates has ample water storage tanks for those times when the city system fails. 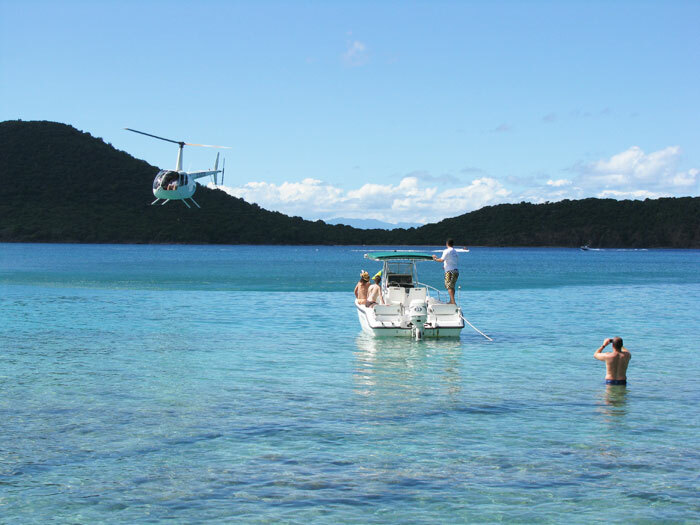 Easy walk-in snorkeling just off our beach in pristine waters. A few minutes walk to Playa Tamarindo's sandy beach. We are located on Culebra's unique Marine Reserve. Tamarindo Estates is nicely secluded, yet only a 5 minute drive to town. For the more adventurous, exciting kayaking across one mile to the Luis Peña Cay. Come visit us at Tamarindo Estates. Experience an enchanting vacation.... The best spot to rest and meditate, do some watersports, stay close with the best of nature, or just enjoy doing nothing, ...and you might become one of our many repeating guests! This is our 17th. year. 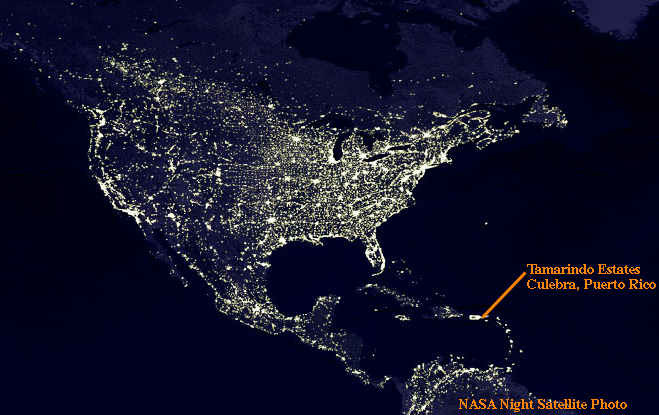 Home to Culebra's National Wildlife Reserve under the U.S. Fish & Wildlife Service. Culebra is home to the endangered Leatherback Turtle and many breeding seabirds. Several pristine, unspoiled beaches around the island. 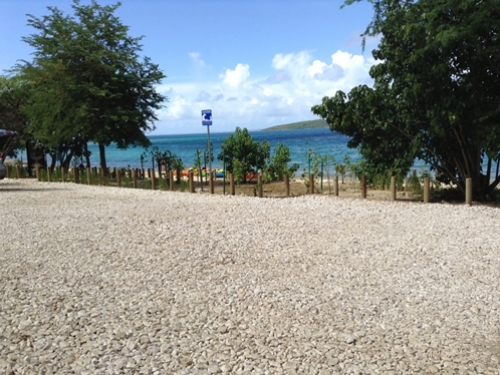 Many exciting sites around Culebra for scuba divers. 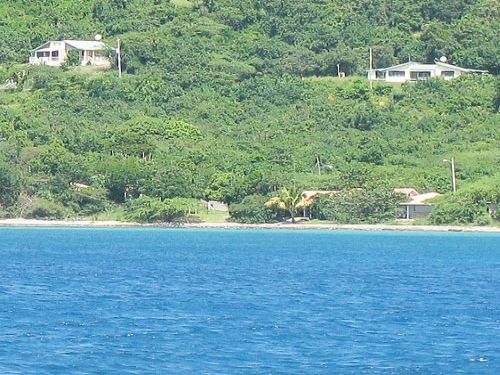 Culebra is a secluded paradise largely untouched by development. Culebra is home to Flamenco, rated one of America's top 10 beaches. Good variety of restaurants and grocery stores. Daily flights and ferry crossing from Puerto Rico. 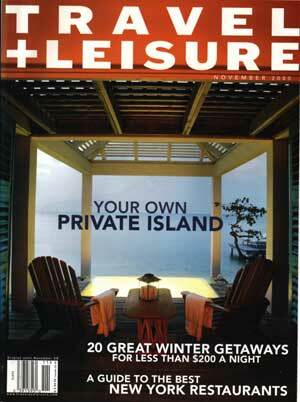 For things to do in Culebra click here. No passport needed: U.S. citizens traveling to and returning directly from Puerto Rico or Culebra are not considered to have left the U.S. territory and do not need to present a passport. Private gated access to the Estates for Registered guests. There are no passports or visas necessary for U.S. citizens arriving directly to Culebra Island or Puerto Rico from the United States. U.S. citizens can travel between Puerto Rico and the United States without going through immigration or customs check points. 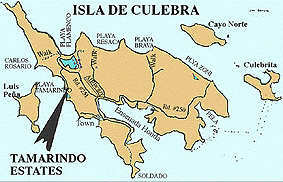 Culebra is one of Puerto Rico's off-shore islands, 10 miles square in area and 17 miles east of Puerto Rico. It is located midway between P.R. and St. Thomas, U.S.V.I. Presently there are about 3000 residents on the island. 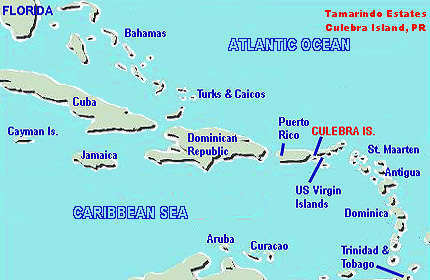 Culebra was discovered by Christopher Columbus in 1493 and was under the Spanish flag until 1898 when Puerto Rico became part of the United States. Presently, the Commonwealth of Puerto Rico enjoys a special status of self-government under the U.S. flag. 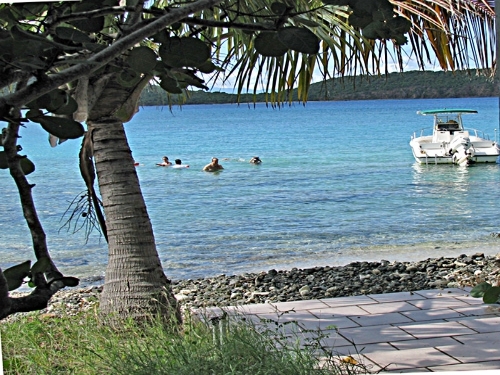 Culebra is an unspoiled divers' and beachcombers' paradise, also coveted by bird watchers. If you are looking for a quiet, relaxing vacation, beautiful beaches, good diving and snorkeling, a laid back atmosphere, and away from the tourist scene, Culebra Island is the place to come! 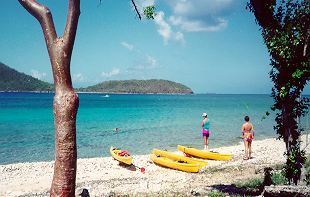 For visitors coming from abroad, the fastest way to reach Culebra is via San Juan, Puerto Rico. The flight from New York to San Juan (SJU) takes 3 1/2 hours; from Miami to San Juan it's 1 1/2 hours. San Juan International Airport (SJU) is served from the U.S. Mainland by American Airlines, Delta, US Airways, Continental, Northwest, Spirit Air, and United. From the rest of the world, San Juan (SJU) Airport is served by Air Canada Vacations, Canadian Airlines, British Airways, Lufthansa's partner Condor, Copa Airlines, and LACSA-Group Taca. There are basically two ways of travelling from the 'Big Island' of Puerto Rico to Culebra. You can either take an airplane or take the passenger boat. Flying to Culebra is usually the most hassle free option, and in 35 minutes you can get from San Juan to Culebra. Flying in from San Juan to Culebra is in most cases the only way to be able to check in into your hotel the same day of your flight from abroad. 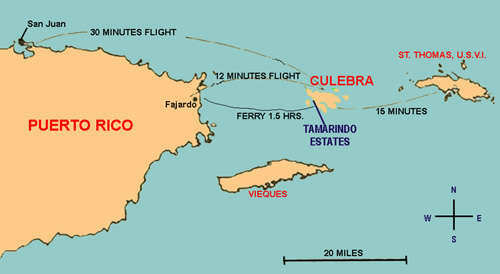 There are several daily flights arriving in Culebra from San Juan Isla Grande Airport (SIG) on Air Flamenco (787-724-6464) and on Vieques Air Link (787-722-3736, 787-741-8331, 1-888-901-9247). Click here for more airline information and ferry schedules. 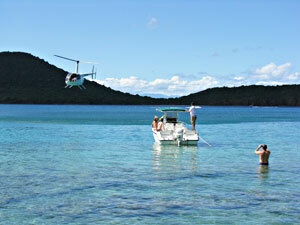 WE RECOMMEND OUR VISITORS TO FLY TO CULEBRA FROM MAINLAND PUERTO RICO, INSTEAD OF TAKING THE BOAT. However, if you are flying in from abroad and want to take the passenger boat to Culebra to check-in at Tamarindo Estates that same day, you would need to land into San Juan not later than 12:30 PM. This would normally allow sufficient time to get your luggage and then the taxi to the Ceiba ferry dock. The last boat you may take and still be able to check in at Tamarindo Estates departs Ceiba at 3:00 PM. 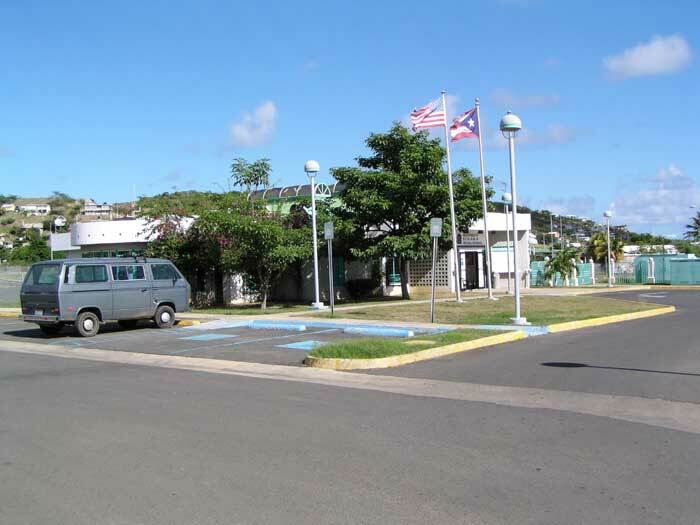 Culebra airport terminal. Click on the image to enlarge. 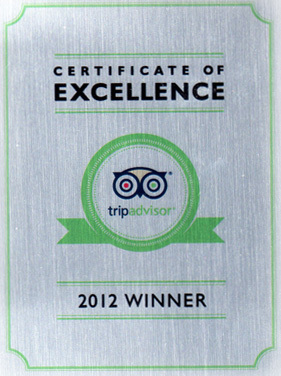 For a photo tour of our hotel facilities, please click here. Culebra, one of Puerto Rico's beautiful off-shore islands, is 10 square miles in area and located 17 miles east of Puerto Rico, midway between P.R. and St.Thomas, U.S.V.I. 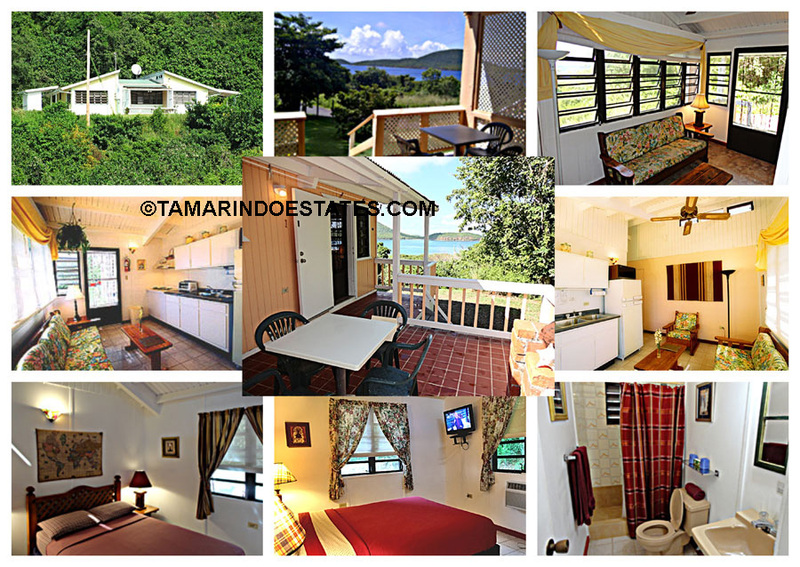 DIRECTIONS TO TAMARINDO ESTATES: From the Culebra ferry dock keep going on the main street (PR Rd. #250) towards the airport. From the airport location drive or take a taxi to Tamarindo Estates, 7 to 10 minutes. From the airport stay on PR Rd #251 North for about 1.3 miles; at Km. 2.2 (by the yellow house) turn left into Tamarindo road till the very end (about 3/4 mile). At the circle on Tamarindo Estates, walk to the office building and follow the instructions for check in.